To start out I decided to loosely follow Peter Reinhart's Seed Culture formula from The Bread Baker's Apprentice. When my starter appeared to be suffering, I gave up on following his formula and followed my own intuition. Happily, doing so worked out well and my bread turned out excellent. When they looked risen, I threw them in the oven, which had been preheated to 500 degrees. I also did the pan of water trick which I discussed in Lesson Three: just after putting the bread in the oven I poured a cup of hot water into a brownie pan which I had placed on the lower rack of the oven. This produces a steam cloud which improves the quality of the crust. If you want to try baking sourdough for the first time on your own, I urge you to take a look at some of the sourdough links I'm putting together. Or read a cookbook: most bread baking books have at least one chapter on sourdoughs, and there are a number of books dedicated to them (such as Crust & Crumb). I baked them on the back side of a cookie sheet. I sprinkled a little semolina flour on it first. Corn meal works too. I keep breaking baking stones. My latest one just arrived in the mail today. We'll see if it is any more durable than the others! when yeasts attack, I attack back! today I threw out my starter from Monday. It was ready to go Wednesday, but instead of using some of it or refrigerating it, I fed it two more days in which it did nothing but sit there and separate. I started over about noon today and thus far, I've looked in on it at least a dozen times. My local Grocery Outlet has a bunch for $4.95 each. I am attempting this starter (my first) this week. I started on Wednesday. On Thursday, I didn't notice any rise at all but I went ahead and continued with the directions. I am hoping I will see some movement by this evening. I will continue to plug along until Sunday morning but I'm not sure how to tell if I have a good starter or not. I wanted to come back and update. Floyd - thank you so much for this lesson. I really hadn't though about attempting sourdough until last week when I was soaking some raisins and remembered this lesson. I figured "what the heck?" I followed your diretions exactly, although my dough didn't get drier and denser like yours and I was managing consistent rises throughout the week. 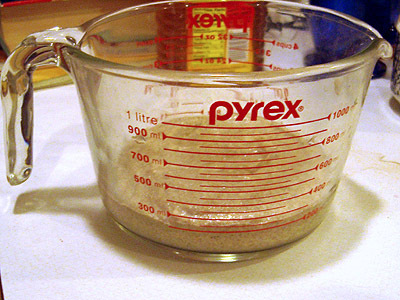 So, while I switched to whole wheat flour on Saturday (actually Sunday morning), I didn't add more water. 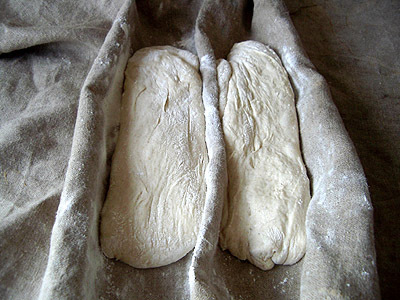 I started the to make the loaves on Monday evening. My dough was really wet so I definitely had to add more flour when mixing and much more flour than I normally add during kneading, but the process went fairly smoothly. I let it rise overnight in the fridge due to time constraints and took it out last night to come to room temperature and finish rising. After a few hours, it seemed risen enough and I moved on to shaping. 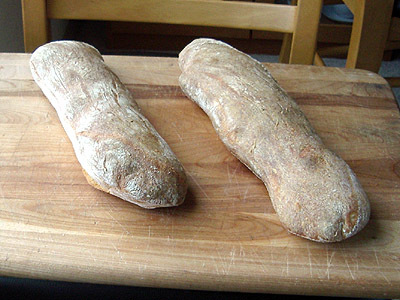 This is my biggest weakness so I sort of shaped them into pretty "rustic" baguettes and put them in a floured cloth for the second rise. It took a few hours for them to appear to be risen enough and I baked as you directed. Much to my shock, for the first time in life - I GOT OVEN RISE!!! I was flabbergasted as I was thinking at this point that my loaves probably wouldn't turn into any type of bread at all. I don't have a baking stone yet so just baked on a baking sheet. I removed my cast iron pan full of water from the oven after 20 minutes of baking because I felt that the bottoms of the loaves weren't getting browned enough. As is my typical M.O., I think I underbaked these slightly because I can't seem to get my Thermapen to take an accurate read on bread and because the top crusts seemed to be getting almost burnt. In fact, I covered them loosely with foil for the last few minutes. Anyway, when I finally cut into the loaves, I was amazed yet again because I had all those wonderful holes that sourdough is supposed to have and taste of this bread was fabulous! The crust was wonderful despite my fear of burning - I only wished that the crust baked more evenly (the bottoms were much lighter than the tops and sides. My loaves actually looked a lot like yours above. Thank you again for posting this! I do have a question. I reserved some of the starter and stored it in the fridge on Sunday like you suggested. Do I need to refresh this and, if so, how often? I would like to bake something with it this weekend. 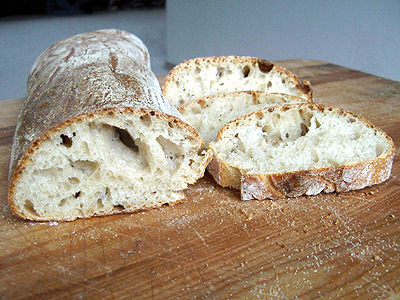 Could you also tell me what other loaves you successfully baked with the starter? TIA. 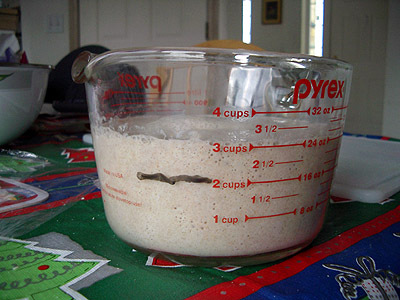 So, can a 4-day-old starter be used for pure sourdough baking without any problems? I have always read that it should be at least 2 weeks before one sholud use it for bread or eventually put in the fridge to store. It can be used as a good levin (As long as you are getting double or tripple the rise after a feeding) but the taste will not be developed. My starter is about 3 weeks old and I baked with a friend who had one about a year old. His bread had a lot more taste then mine did but we had about the same amount of rise. Thanks for your comment. I was afraid that on day 4 the rise could be caused by false yeast and also the bacteria may not be what would be wanted. i have an interest in brewing, and i think that letting the starter breath is just to allow oxygen to get to the yeast. i do that by just stirring my starter very vigourously to create air pockets in it, instead of leaving it out and letting something nasty fall into my jar. There seems to be a lot of disagreement on this issue; I know you wrote this article was written many years ago, and I wonder if your opinion has changed. Yes, this is the 11th piece of content I posted on this site. There might have been... 3 members on the site at that time, including my wife. Probably only us 2. Think of this more as a blog entry from someone learning about sourdough than anything authoritative. I've not baked in 3 months (we got home from an extended vacation yesterday) and not thought deeply about sourdough in many months more, so this isn't issue I'm prepared to debate at this time. I do intend to feed my starter tonight and see if it survived the extended period of neglect. Fingers crossed that there is still some life in it, regardless of its origin.